Production company Endemol are best-known perhaps as being the brains behind some of the biggest franchises on TV. Big Brother, Deal or No Deal, and Who Wants to Be a Millionaire: all are Endemol babies. However, the firm is also known for several other popular gameshows, including a curio from England - Golden Balls. Golden Balls was a daytime show catering for the student and housewife market from 2007 to 2009. In the studio sat a giant box containing 100 golden balls containing cash values from £10 to £75,000. 12 balls are randomly drawn from the machine, with four "killer" balls added to the mix. Contestants then have to guess which value is in each one (think of a kind of FBI vs Mafia type game, but with cash). 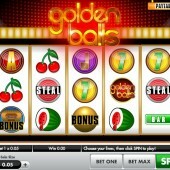 As well as creating some of the world's most popular game shows, Endemol Games have also adapted many of them into exciting online slots, and Golden Balls retains all the "suspense" of the show (if that's your kind of thing). 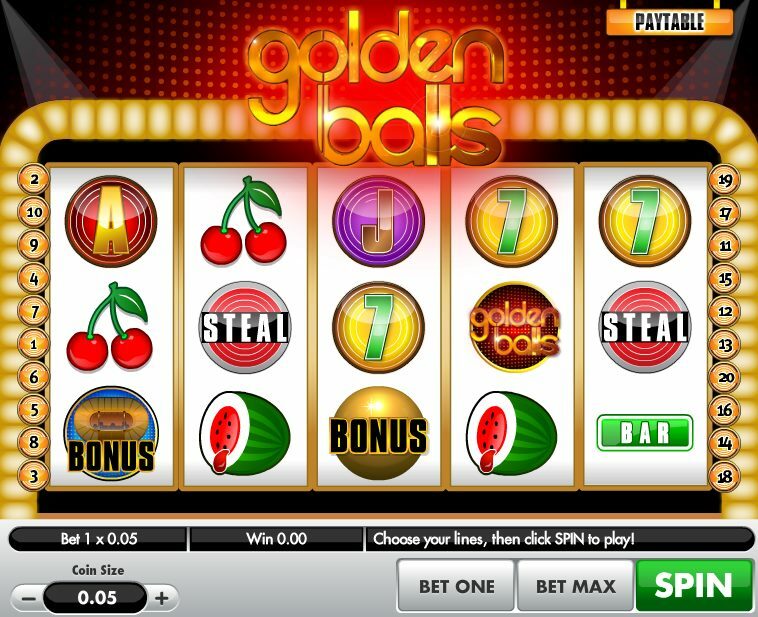 Some of the features of the show have been retained, in particular the Split or Steal feature which lets contestants split cash with other players or 'steal' where one player will win all and the other leave empty-handed. On the 5 reels in this 20 pay-line game you get some 7-to-Ace symbols in the show's font, £ signs, the Golden Balls logo, plus some classic icons from old fruit machines - a BAR, a melon and a cherry. The Golden Balls logos are Wild and substitute for all regular symbols. Three gold Bonus Scatters left to right triggers the Golden Balls bonus round. You will see 9 podiums on-screen. Keep opening balls to reveal cash. Your winnings accumulate until you pick out the Killer ball. The remaining balls are then opened and the cash values paid out at a lower rate. Three blue Bonus Scatters left to right, meanwhile, triggers the Golden Bank feature. You will see three golden balls - simply choose a ball to see what cash prize is inside. The game ends when you reveal the Killer ball. Finally, there's a third Scatter - the Steal icon - which pays cash wherever it hits. If you've seen the original TV show you'll know it's based - a little like Deal or No Deal - on game theory, or basically knowing when to hedge your bets. If you're a fan of the original game show you might enjoy some of the touches to this game, but there's no way it's on a par with something like Endemol's very own Deal or No Deal - The Banker's Riches slot or the thrilling X Factor - Steps to Stardom slot from Ash Gaming which feature clips from the show. Something like that would have lifted this above the norm. As it is, two Pick 'em bonuses are probably not enough to get most slots players' juices flowing.